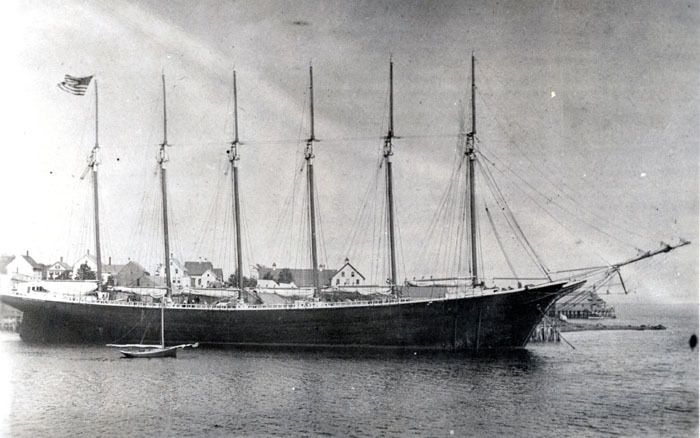 The Augusta E. Herrick was built in Gloucester, Massachusetts in 1877 for William P. Herrick, a highly successful Swans Island, Maine, mackerel fisherman. Modeled and built by Daniel Poland, Herrick wanted a yacht-like vessel. He also wanted a fast vessel, and he got one that was fast both reaching and running. The bow was relatively long and fine. 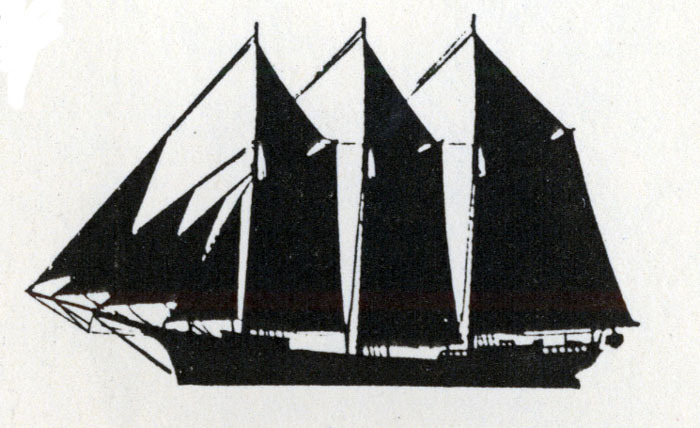 She was the only centerboard schooner built for the Banks fisheries; Herrick wanted the centerboard in order to be able to work in and out of some shallow Maine ports. 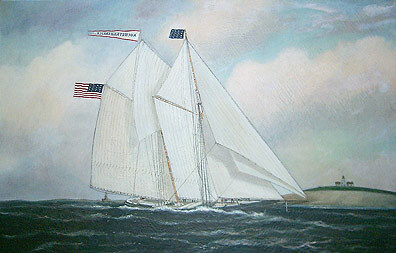 Herrick sailed her until he sold her to Boston in 1891. One of seven 3-masted schooners built by Bath's Goss & Sawyer yard in 1873. This one was for a Taunton, Massachusetts captain, J.M. Phillips, who sailed with a few breaks until 1886. After his death about 1898, his wife continued to own the vessel. These 3-masted schooners were the most common schooners in the coasting trades. 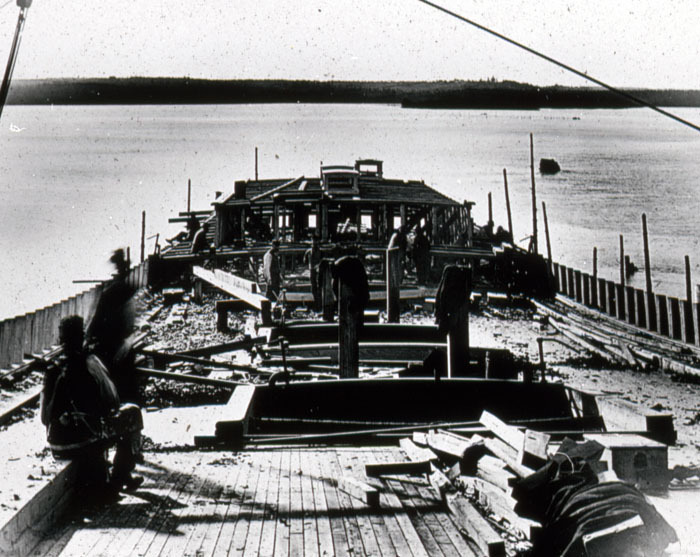 It is unlikely that Snow, born in 1857, saw this scene in Searsport in 1918, after the days of Searsport shipbuilding were well in the past, although buildings may well have still been in place. By then some yards were active in towns like Belfast, Camden and Rockland but the days of building coasting schooners were gone. 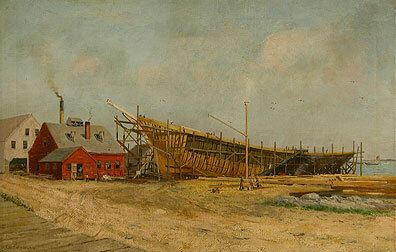 Here the artist shows the schooner partially planked. Smoke comes from a building that could have housed a steam powered saw. Men work at a crane in the foreground which is piled with the usual raw timber that was the stock of the yard. 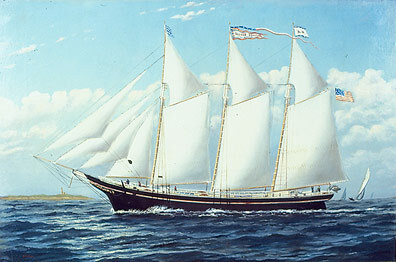 The George W. Wells was the first 6-masted schooner built. The first image shows her after her 1900 launch at the H.M. Bean yard wharf in Camden, after she has been outfitted for sea. Sails are bent onto the yards and gaffs.The working sloop swinging at a mooring alongside, probably only about 35 feet long, shows off the tremendous size of the 320-foot schooner. The second image shows her before her sails are bent on, with the last of the rigging underway. Launched in Bath at the Percy & Small shipyard in 1901, the Martha P. Small carried coal for her Bath owners, then went into the South American trade during the First World War carrying case oil (kerosene). She was sold to Canadian owners in the spring of 1917 and continued sailing to South America, and was finally broken up in Montevideo in 1923. 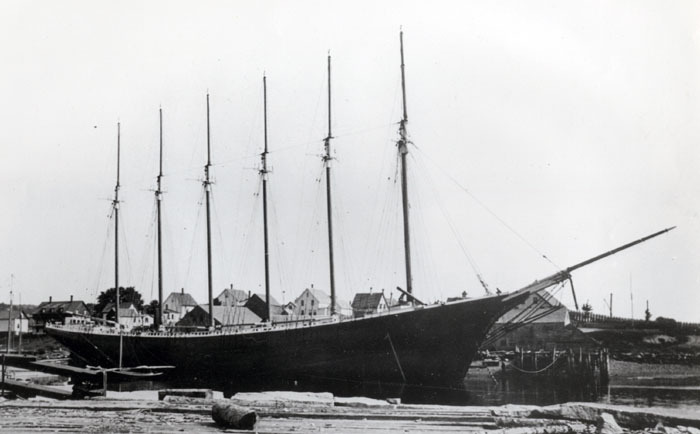 A need for shipping in World War I revived the Maine schooner building industry. No schooners were finished before the war's end but they sailed into the 1930s. This provided the last opportunity for photographers to record large wooden shipbuilding. The schooner George W. Wells was the first six-masted schooner ever built, launched in Camden in 1900. 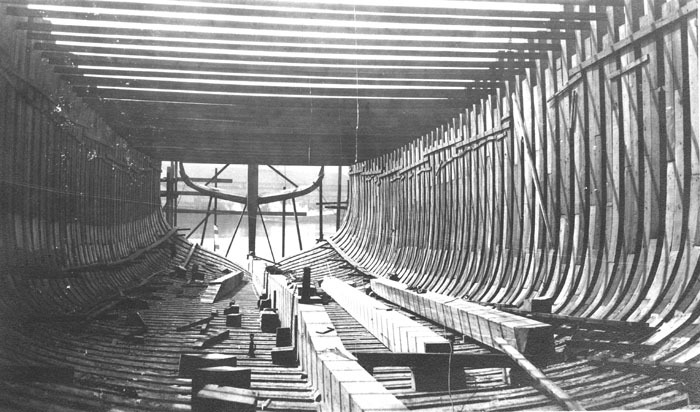 This stern view shows the deck being planked, and the decking and sides of the after deckhouse going on. Schooners are fore-and-aft rigged sailing vessels, with at least two masts; the after mast is the same height or taller than the foremast. Until the middle of the nineteenth century, all schooners had only two masts. 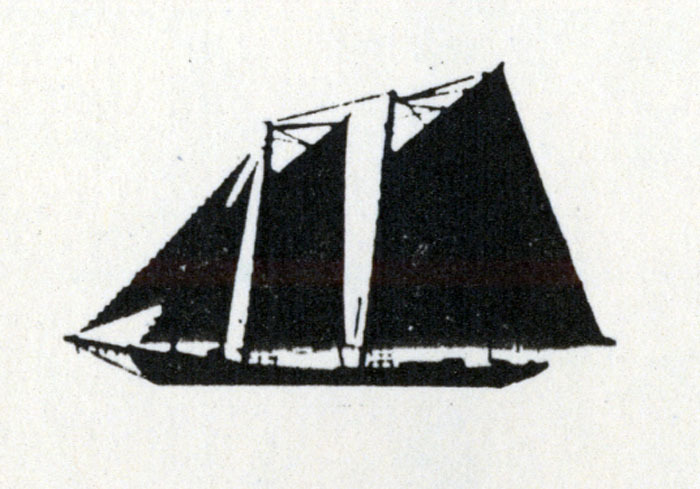 The diagram is from the Nova Scotia Museum Informational poster, Sailing Ship Rigs. 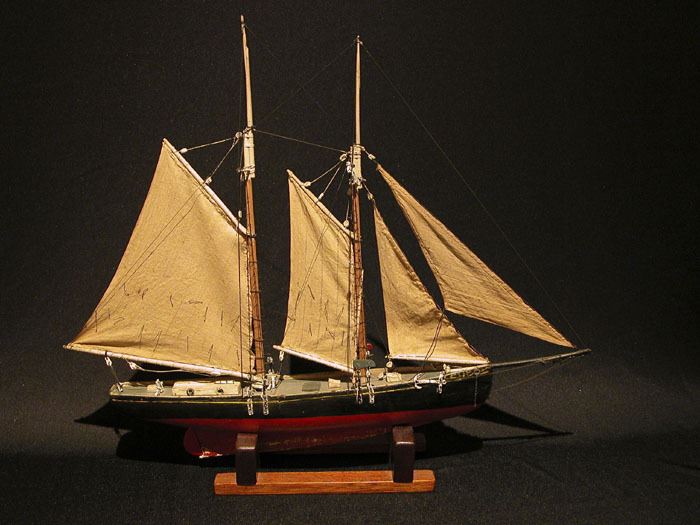 Model of the fishing schooner Joy. This model was built by the lighthouse keeper at Saddleback Ledge in Penobscot Bay. Schooners were the most popular type of sailing vessel used for both inshore and offshore fisheries throughout the nineteenth century and into the twentieth century. The model builder did not set his model up with fishing gear. Schooners are fore-and-aft rigged sailing vessels with at least two masts; the after mast is the same height or taller than the foremast. 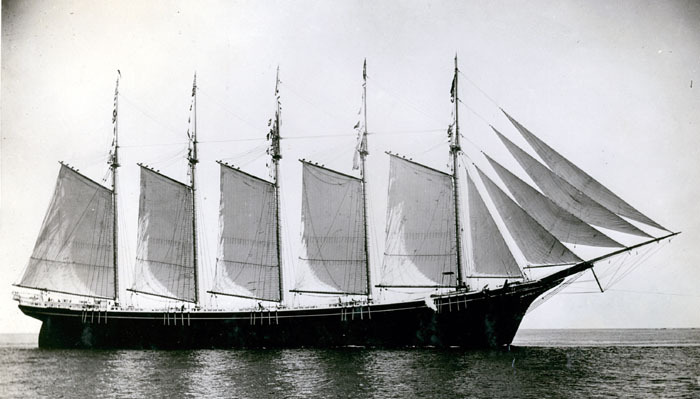 Three-masted schooners were also called tern schooners. The only 7 masted schooner was the Thomas W. Lawson. More commonly found in the latter half of the 19th and early 20th century coastal trade were 4 and 5 masters. A few six masters were built.